MSPs are to launch an inquiry into the future of Scotland's energy industry. They will be challenging industry leaders to tell them how Scotland can achieve its ambition of becoming the renewables powerhouse of Europe. 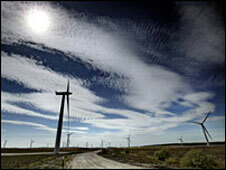 Scotland has been set a target of producing 50% of electricity from renewable sources by 2020. The Scottish Government wants industry members, meeting at a conference in Aberdeen, to come up with ideas on how to achieve this goal. The inquiry will be handled by the Scottish Parliament's economy and energy committee. The government has already offered a £10m Saltire prize for innovation in marine energy, but the committee wants to hear wider ideas on production, distribution and the more efficient use of energy. Tavish Scott, committee chairman, said he believed it would be hard to meet the target as local opposition to big projects had already proved difficult to overcome. He highlighted the recent rejection of a huge wind farm on Lewis as an example. Speaking to BBC Radio's Good Morning Scotland programme, he added: "People are concerned about the sheer scale of some of these projects that do come forward, but I would hope that one of the issues the committee can address is looking at that process in its entirety. "We have to consider what more could be done at an earlier stage to make the argument for tackling climate change, and also how we ensure it is designed in the most sensitive manner." Scottish Renewables, the green energy trade association, welcomed the launch of the inquiry. The organisation's Jason Ormiston said: "If the Scottish Government's target is to be achieved then the triple barriers of planning, grid and skills need to be resolved now otherwise crucial climate change and energy security objectives will never be delivered in Scotland." He added: "However, proposed European energy policy will change the game and any scrutiny of energy policy in Scotland must also look at the way we use and generate heat as well as electricity. "A joined up energy strategy is essential and we expect the committee to look hard at how this can be achieved." The All Energy 08 conference, which began on Wednesday, has already heard from Energy Minister Jim Mather. He told delegates that efforts would continue towards economic growth and a low carbon economy.